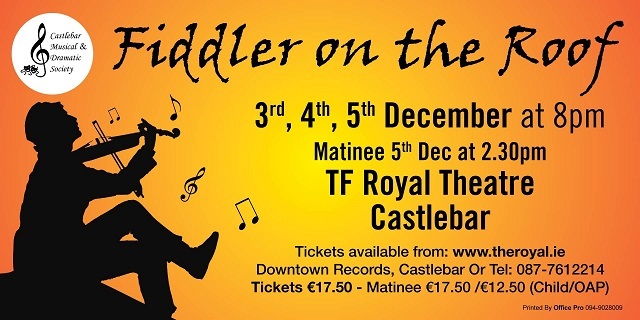 Castlebar Musical & Dramatic Society will present 'Fiddler on the Roof' on the 3rd, 4th and 5th December 2015 in the TF Theatre Castlebar at 8pm with a matinee performance on the 5th December at 2.30pm. Fiddler on the Roof is a classic Broadway musical with music by Jerry Bock, lyrics by Sheldon Harnick and book by Joseph Stein. Set in Russia in 1905, the show tells the story of Tevye, a poor Jewish milkman, trying to maintain his traditions and beliefs whilst raising five independently-minded daughters during a time of political upheaval. 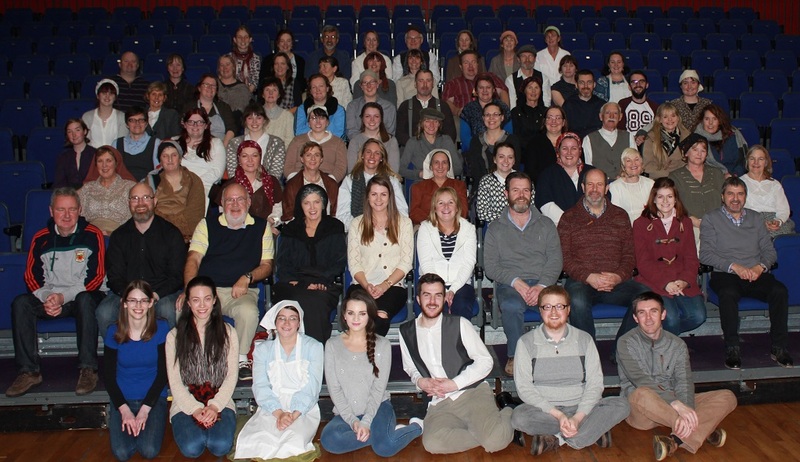 The cast and chorus of 70 talented performers are all local to Castlebar and the surrounding area. The show is directed by Alanna Ní Mhíocháin with musical direction from Deirdre Lee and choreography by Colette McGinty. The production team were spoilt for choice when it came to casting the show and gathering a chorus. Director, Alanna Ní Mhíocháin, was very impressed with the talented individuals who showed up to audition for the show: "We were absolutely blown-away and delighted by the standard of musical and acting ability of all those who joined us for this year's production. We have an extremely strong group of performers who have brought this story to life and are going to deliver an extremely polished and entertaining show." This will be the second show for the society and follows their very successful production of ‘Oklahoma!' last year. Not only did the society delight local audiences with their inaugural show, but they also impressed AIMS adjudicators with Donna Ruane winning a national AIMS award for Best Supporting Actress for her portrayal of ‘Aunt Eller'. Donna, no stranger to the stage and theatrical circuit in Mayo, has rejoined the society again this year and will play the part of ‘Golde' opposite Ronan Egan, a newcomer to the society, who will play ‘Tevye' in their upcoming production. Jennifer Hiney, Chairperson of the society, described the effort that goes into putting together a production of this size and standard: "The amount of time, energy and dedication required to bring a musical to the stage is impossible to quantify. The cast and production team have been rehearsing tirelessly since the beginning of September. A production like this cannot happen without the support of local people and businesses. We are very lucky this year that over 30 local businesses have come on board to sponsor our show and we are extremely grateful to them." Tickets for the show are available by calling 087-7612214. They are also available in Downtown Records, Castlebar or from any cast member.